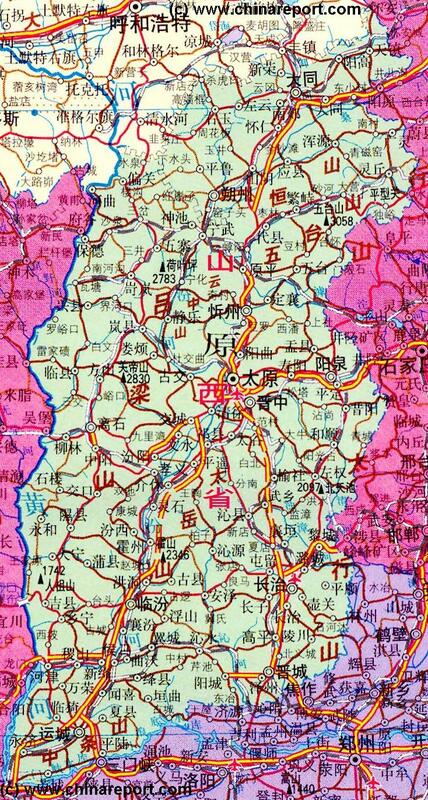 This Geographic Map gives an overview of Shanxi Province of China Entire. 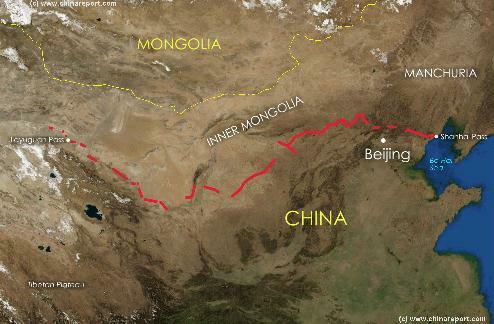 The Map includes border areas of neighboring Shaanxi Province in The West, Inner Mongolia Autonomous Region in The North, Hebei Province to the East and last but not least Henan Province in the South. As described in our Introduction to Shanxi Province, 80% of the entire province of Shanxi is Mountainous or Hilly. The North however is the most rugged and wild. Starting in the Very North, the province of Shanxi is formed by a mountainous plateau which lies higher than the rest of the Province.The Northern Border of the Province here is formed by the most outer layer of the Great Wall of China itself, making use of the high mountain natural bariers here, arching north Around the Border Fortress City of Datong. From Datong the Great Wall continues West along the Mountain-Ridge all the Way until it meets the Yellow River just North of PianGuan. Due East of Datong and to the South-East lies the highest mountain area of the Province, know as the WuTai Shan Range. This Mountain Area, which once prevented (almost) any direct connections with the City of Beijing to the East, has its highest peak, the Xiao Wutai Shan at 3058 meters.The Wutai Shan, Five Terrace Mountain, is one of the Five Holiest Mountains in Chinese Mythology and thus is home to a multitude of Temples and Monasteries. In Fact the entire North of the Province is the richest in history and historic monuments. Beyond Datong and Wu Tai Shan, down South the High Plateau of the North continues, approximately to the City of XinXian. From Here it subsides and a River and Valley lead South-East towards TaiYuan and Jinzhong. 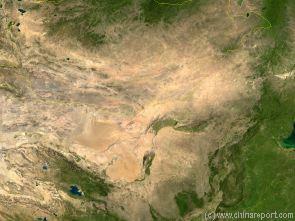 Satellite Image Overview of China, The Gobi Desert and flow of the Yellow River with Mountainous Shanxi Province clearly visible west of the Southward part of the Great Bend. The Capital City of TaiYuan lies at the most Central Point in Shanxi Province. From the North and West the valley of the Hai River along which runs the railway give access from the Northern Province and Datong through PingXingGuan Pass. There is a spectacular 6188 meter long railway tunnel located inside the pass that offers a spectacular ride South from ShuoZhou, beyond the first mountains. From the East of TaiYuan NiangZi valley and pass leads upwards from the Central China Plain, from ShiJiazhuang in the South of Hebei Province. In the West a valley leads away eventually to wind up at the Yellow River and the border with Shaanxi Province. The roughest direction to choose from TaiYuan is directly South or South-East where the terrain leads steeply upward into another mountainous plateau with only one passable valley. The Highest Mountains here lie between Heshun and Yushe Village where mountains reach over 2000 meters, but the plateau itself continues further South to Changzhi and beyond.The entire Eastern Border of Shanxi Province below TaiYuan is formed by this Plateau and its Eastern TaiHang Mountain Ridge. It continues even further South, all the way to JinCheng in the far South near the Border with Henan Province. To the the South and West from Taiyuan, the valley of the River Fen (Fen He), the Central Valley in South Shanxi Province leads away towards Pingyao and LinFen far beyond. Although still rugged and mountainous this Area of the Province is much greener than the rough plateau of the North. Mining industry in all sizes dominates in this area, where otherwise the simple and traditional Shanxi Life continue. The more to the South in Shanxi Province, the more populated. Go South from Linfen until in the extreme south-west corner of Shanxi Province the terrain is mainly green and hilly and not as wild as the very Northern Half of the Province. The South-West is home to the largest lake in Shanxi Province, the XiChie Salt Lake. In this corner of Shanxi Province many citizens live in traditional cave dwellings, as the do upstream on both the Yellow River (Huang He) and the smaller River Fen. This south-western corner of Shanxi Province, cornered in by the last great bend on the Yellow River, is especially rich in Cultural Sites. Find them between Yuncheng and Ruicheng, or cross the SanMenXia Water Reservoir of the Yellow River and explore the green countryside and hill-lands further South into Henan Province or East towards Xian in Shaanxi Province. As mentioned, the Western Border of Shanxi Province is formed by the (once) Mighty Yellow River, the birthplace and cradle of the earliest Chinese Civilizations. Nurtured by the Fertile Waters and deposited Loess Lands the first Chinese Men built their civilizations in this and other area's upstream. Although recently dammed in many places and less wild, the Great River still forms a largely impassable barrier in the West, only crossed by few bridges. Within the Province Due West of TaiYuan lies the might Guandi Shan, with a Height of 2830 Meters. Together with other mountains, among which Helcha Shan and Helan Shan more to the North, Guandi Shan makes up the LiuLiang Mountain Range running North-South, just west of the Yellow River, through Shanxi Province. As a result West Shanxi Province is equally mountainous as the East. Due to the presence of this high mountain range and the steep yellow river gorge that runs on the Western Border from PianGuan south almost to Lishi, population in the West of Shanxi is minimal. The Main City of the West is Lishi, where nearby there is an overpass on the Yellow River leading West.In the extreme south-west Houma, Yuncheng and Hejin are the most important Cities and Population centers, located on main transit routes.